Why Amitabh Bachchan’s Assamese Movie Never Saw the Light of Day? Bollywood legend Amitabh Bachchan has acted in hundreds of Bollywood movies and fans are aware of most of them. However, not many of his fans know that Big B was once part of an Assamese movie, which never saw the light of day. 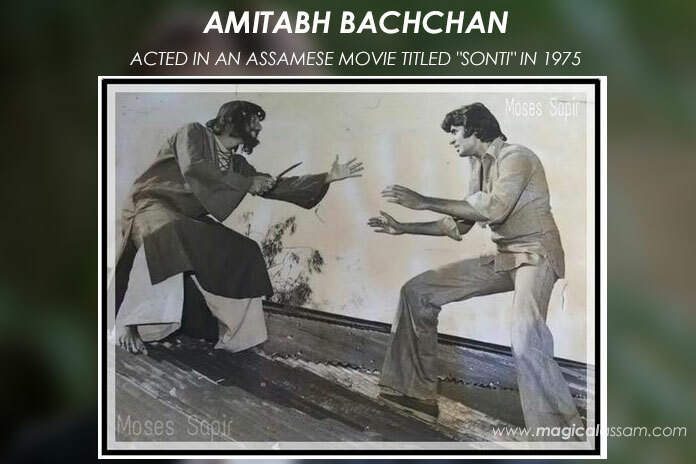 The Assamese film, titled “Sonti”, was directed by Amit Mitra in 1975 and Amitabh Bachchan played a key role in the action-packed movie. While shooting for the film was almost complete, it was never released due to a clash between the producers, director and distributors. “The shots were taken in then Calcutta (now Kolkata) and the film was almost complete but due to a clash on a financial issue among the producers, director and the distributor, the film was not released. Amitabh Bachchan played a positive character in ‘Sonti’. The Assamese audience has missed a good opportunity of watching Amitabh Bachchan portraying a character in an Assamese movie,” Eastern Chronicle quoted Dinesh Das, who had also acted in the movie. The unreleased movie, “Sonti”, was reportedly an action film that also featured Assamese actors Akhil Deka, Dilip Choudhury, Ila Kakoti and Parag Patra. Comment: To our loving magical assam website. Please try to talk about assamese movie sonti re release plan with our new generation producer .